With the compact SUV class growing as one of the most popular among drivers, the Ford Escape sets itself apart with an innovative collection of convenient features designed to streamline everything from loading the cargo area to maneuvering into a tight spot. 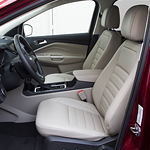 Busy drivers will appreciate the many thoughtful features integrated into the Escape's design. The rear seats fold down to provide over 68 cubic feet of space, made easy to load thanks to the foot-activated hatchback. Push-button start allows the driver to concentrate on other things than finding keys, and backing up is a breeze with a rear-facing camera that alerts the driver to any obstruction. If you would like to take a Ford Escape out on the road for a test drive, visit us at Lithia Ford Lincoln of Roseburg. We have an extensive stock to choose from and can answer any questions you might have about the Escape's many convenience features.